This week’s teatime post features one photo from a Brave Writer family and one report from another Brave Writer family. Thanks for all of your contributions to this blog. 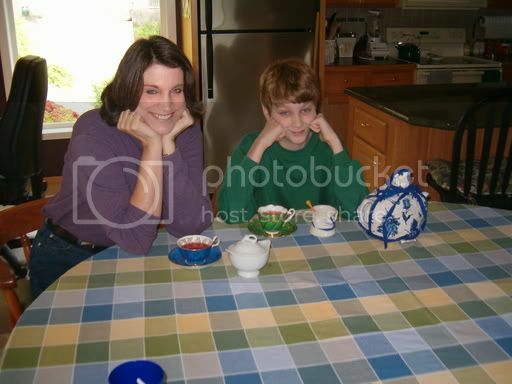 I love seeing/hearing how your family makes teatime personal and poetic! We had our first tea time recently and it was great!! Even though we don’t have a lot in the way of fancy linens and stuff, we still managed to make it elegant. My daughter decided to get really dressed up for the occasion. We each read two poems aloud to each other. Two of my daughter’s favorite poets are Jack Prelutsky and Shel Silverstein (although she adores Mr. Shakespeare and Robert Frost just as much!). She picked two poems out of her Jack Prelutsky books and I read from “The Harp and Laurel Wreath”. I think she was just relieved that I didn’t choose to read “Oh Captain, My Captain”. She said there was no way I was aloud to cry during our first tea time! To add to the ambiance, we had Mozart playing softly in the background. Can you hear it? A few years ago I’d have to pay soonmee for this information.